Everyday these tiny, small creatures scamper across my roof. The squirrels run across my fence and scour my yard for the nuts they hid in the fall. Watching the squirrels is comical. Yet, every time the squirrels put a smile on my face and laughter in my belly. Can you say that every person you interact with smiles and laughs as a result? In life we tend to get too serious. We are either so focused we don’t realize other people exist or we’re too distracted (by phones, tv, news, etc.) to pay attention to the needs of other people. Would you want to regularly hang out with either of these people? Probably not. 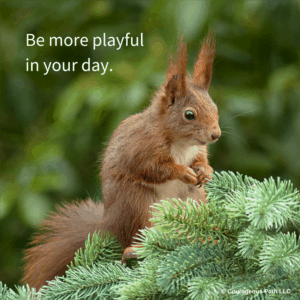 We most enjoy being around people who are playful – just like the squirrel. This way we have fun in our everyday moments and don’t take life too seriously. What’s the best way to truly connect with someone? Share a laugh. Even if it’s a really bad joke. How can you bring a sense of fun and play to your next interaction? Or better yet – your next meeting? How can you lighten the mood or uplift someone’s day? How can you make someone laugh today? Squirrels are mischievous creatures always on the move to be more playful. I hope you bring squirrel characteristics into your day. Wishing you an abundant, joyful and prosperous day! There’s one easy way to wreck a relationship. See how this unravels. Andrea came home from two days away. As she approached her house, there were construction workers outside and a construction trailer in front. What the heck! Who are these people? What are they doing here? As Andrea pulled into her driveway, she quickly got out of the car, kept her cell phone handy to call the police, and inquired what was going on. She slowed down her quick frantic walking pace and realized the contractors finally came (after 3 months of calling) to fix the siding on her house from major hail damage over nine months ago. She took a deep breath and asked for the person in charge. She stated that she was never notified. Andrea took another deep breath and said, “Walk me through the already completed work and your next steps.” Everything made sense. Whether it’s as simple as a notification, any assumption can lead to anger, frustration, and annoyance. 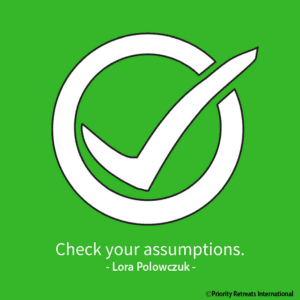 Most failures in relationships come from assumptions. In a romantic relationship, people often get frustrated because someone didn’t do something. What happens is the frustrated person typically fails to ask questions and then makes inaccurate assumptions. What type of relationships do you want? Fruitful, empathetic and understanding or constant strain and tension? What’s the lesson in all of this? Have the courage to ask the right questions in any relationship. This will lead to understanding and empathy instead of frustration, blame, and anger. This week, what questions will you ask to lead to better relationships? Alexia desperately wanted a promotion. She worked long hours to prove she was worthy of the next step. Yet, the long hours took a toll on her friendships and her young child that she only saw for an hour before bedtime each evening. Alexia thought, if only I could get that promotion, I’d be set. Have you ever been in a similar situation? The promotion never came and she was let go from her company. Alexia kept thinking, What did she do wrong? What happened? As the next week went by, she started cutting out unnecessary expenses and spending more time with friends and her young daughter. She recognized that working long hours for more money didn’t provide what she truly wanted – connection with others. A month later, Alexia was offered a new job. This time Alexia decided she would work differently. She purposely scheduled time with friends and her daughter and kept to her weekly budget. She felt in control of her destiny. Alexia now spends time doing what she loves with who she loves. Will you take the time to figure out the impact you want to have in each area of our life? By identifying your impact, you can figure out what’s worth striving for vs what you can let go. Alexia realized the hard way, she was striving for the wrong thing. Persistence for your Impact GoalsTM brings about excitement, joy, and harmony. Persistence for the wrong thing brings about stress, overwhelm, and exhaustion. I want you to have the former and not the latter. Discover your Impact GoalsTM and what’s worth striving for in 2018. Schedule a complimentary session today. This time of year, we want something different from the old. We crave something new, fun, and anything that makes life easier. Yet, it’s often hard to make those sweeping changes. It seems daunting. The reality is – what you choose today will affect you three months from now and even years from now. 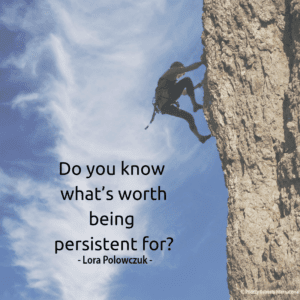 So, the big question is – what do you truly want? 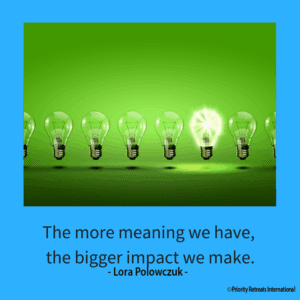 What impact do you want on a particular area of your life? Doing the same thing you did last year will only get you the same results. What’s one thing that you want to go smoother, easier, less hectic, and more with the flow? Is it a different tone in a relationship? Is it a career move or taking on a new project? Is it more playtime or a fun hobby? Is it learning a new skill? Four months ago, I discovered community was a big value for me and I wanted to be around more like-minded folks, especially in the mountains. The universe answered my calling. Last fall I was invited to join a group ski house in the mountains. While knowing few people in the house, I took a leap of faith and joined. This weekend proved I made the right decision. I’m reaping the benefits nearly four months afterwards. I met incredible people who share my same philosophy of clean eating, creating the lives we want to live, and getting mentally and physically stronger. Instead of getting stuck in horrendous ski traffic back to the city on Sunday night after a fun day of skiing, I cooked a healthy meal, got a good night’s sleep, and caught Oprah’s amazing Golden Globes speech. I avoided the angst that goes with bumper to bumper traffic and an unhealthy meal on the way home. A simple decision and a leap of faith reaped its benefits. My mind and body were rested to start Monday off fresh. 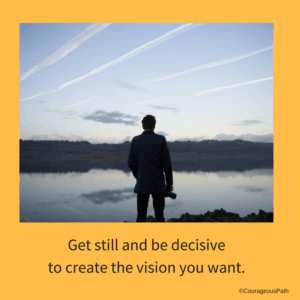 For 2018, how will your courageous decisions align with your vision for the future? To start, ask the universe for what you want. If you never express what will make your life easier, how will the universe know what to send you? Check out last week’s blog on Creating Impact Goals™ for more details. Then, when the opportunity presents itself or you create it, go for it! Do you want help to make this happen. Schedule a short session and let’s get you going in 2018. Happy New Year! 2018 is here. It’s a new year and the best part is (drum roll, please). You get to choose how to live each and every day. From here on out, the possibility of anything awaits you. Will you choose to live into your dreams? Or, will you choose distraction? Will you honor the person you want to become or stay frustrated that not everything went right last year? Each morning, each moment, we choose how we want to live. Several years ago, my friend Adam drove me to the airport for my flight to Bangkok, Thailand for a two week travel adventure. Adam stated, you go on a lot of once-in-a-lifetime trips. I thought to myself, you’re right, I definitely do! The thing is ever since my first international trip to Europe after college, I made a point to travel internationally at least once a year. Trips varied from work in Africa, to adventures in Asia, to mountain climbing in South America. No matter the reason, I made it a point to do this each year, as I loved to experience new perspectives, cultures, and scenery. What will you make a point to achieve in 2018? I want more for you this year. Something vast, expansive, joyful, and fun. I want you to achieve your dreams not just think about them. Dreams have passion behind them, stretch you into something new, and make you believe you can achieve the impossible. Dreams give you the ammunition to keep going even though it’s hard or difficult to get there. Dreams impact you and those around you. They touch the depth of your soul and make you come alive when you talk about them. Dreams have a bigger calling and a big why behind them. And, the only difference between a dream and a goal is a deadline – and one more piece I’ll mention below. For example, most people want to get healthier in 2018 and simply state- I want to get healthier. Or, I want to lose 10 pounds of weight. This is vague, very vague. And vague gives you vague results. If you said instead, I want to have the energy to chase my kid up the hill or even increase my speed on a hike, your reason delivers impact. By playing with your kids more you develop a better relationship with them. By hiking with others, you create community engagement and health simultaneously. Your why creates meaning and the more meaning we have the bigger impact we make. We often wonder why we are motivated or not motivated towards working on a big goal. Goals tend to be the so-so thing we think we should/need to do and won’t do in the long run because we see no meaning behind it. Simply said, you won’t work on goals that have no meaning. However, you will work on something that will impact you, your loved ones, and the world. And, that’s a big difference! This year, I want you to make Impact Goals™. Specifically, think about the Impact you want to make in 2018 with yourself, your career, your loved ones, and the world around you. What are three (not five, not ten) big impacts you want to achieve in 2018? Why is each Impact Goal™ important to you? Who will benefit from the Impact Goal™ and why is that important to you? Impact goals lead to achieving your dreams. And, I want you to achieve more dreams this year. Join me to create big impact and achieve your dreams by replying to this email. I’ll tell you the extra details to creating goals that impact you, your loved ones, and your world. Wishing you a prosperous, joyful, and abundant 2018! © Courageous Path LLC. All Rights Reserved. How choice determines your well-being. What type of people do you surround yourself with? © 2019 Priority Retreats Intl. An ICON Experience.